As a very successful scallop season came to a close, the fishing was on the upswing. The water temperature the days I fished was as low as 72 degrees, ten degrees cooler than a month ago. 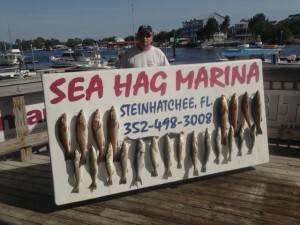 With that drop in temperature, the fish have become more active. 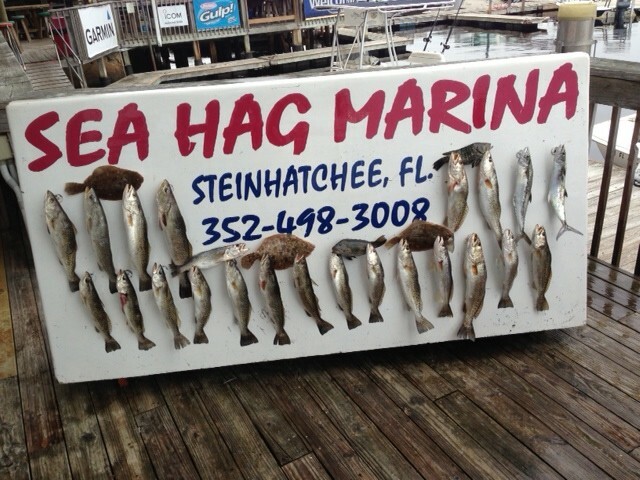 Additionally, considerable amounts of whitebait have joined the pinfish and mullet inshore, and while a little inconsistent, trout were found in some of our usual fall areas in 2 to 4 feet of water. 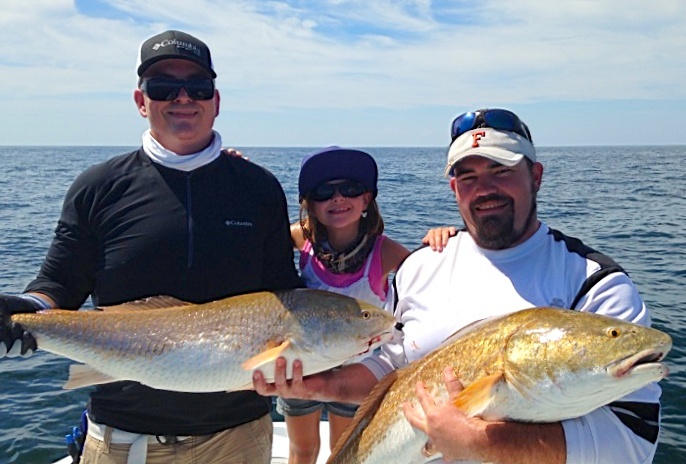 Redfish have begun to school, making for somewhat of a hit-or-miss situation. The floating grass has gradually disappeared and the water continues to clear up south of the river from Hardy Point to Rocky Creek, and at Pepperfish Keys. Trout and redfish were taken both north and south of the river. The Taylor County Trout Tournament had some great catches, with Jason Witherspoon and Paul Wilson taking home the $1000 trout stringer prize with 12.10 pounds. Jeff Evans caught the largest redfish, 7.22 pounds, and Kala Hobbs the largest trout, 4.46 pounds. 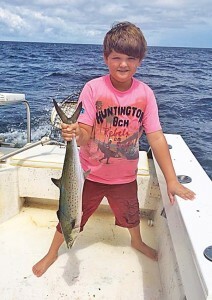 Offshore, the kingfish bite has been starting up, amberjack have been available, and some fine Spanish (over 5 pounds) have been taken nearshore as the whitebait pods continue to migrate. Cobia have also begun showing up around offshore structure but are still rare on the flats. 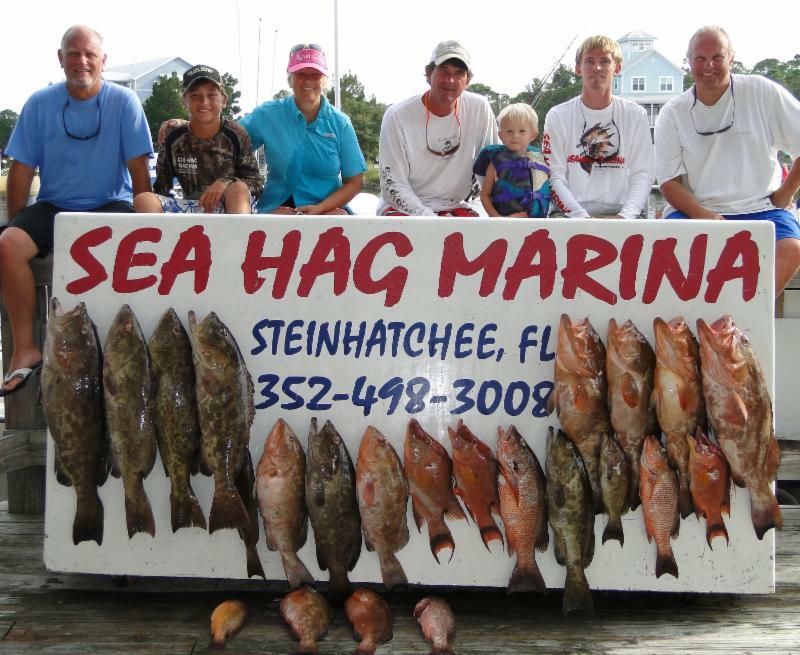 Spearfishermen and women have been scoring tons of grouper and hog snapper as you can see among our pictures from this month. 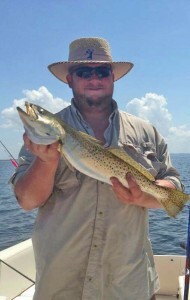 Bill Ashley from Nashville, Ga. got this fine trout fishing with a Red Fin lure. 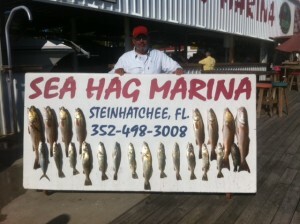 Greg Hause from Alachua with a fine trout and redfish caught during the Santa Fe Raiders Tournament. 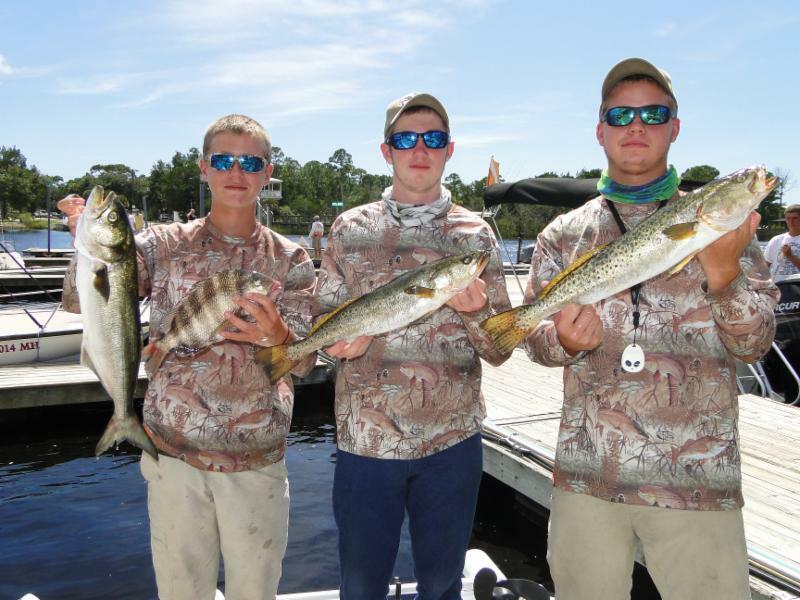 Fishing the same tournament earlier this month, Bradley and Collin English and Cody Clark found these nice trout, bluefish and sheepshead. Chase Norwood and Luke Matthews releasing their second-place redfish after the Santa Fe weigh-in. They finished second; congratulations, guys! Jeff Evans, Cornella Silveira and Hadson Carter caught these redfish during the Taylor County Tournament, with Jeff taking first place. Capt. Leiza Fitzgerald with a fine red grouper. 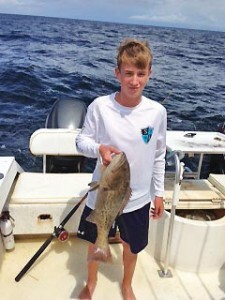 Jordan Hewitt with a cobia almost as tall as he is. 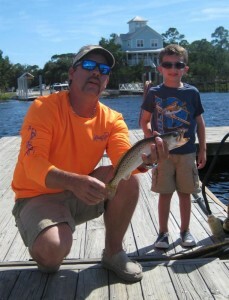 Levi Howard caught his biggest trout, but he passed on actually holding it. Sonya Reese nailed this 32 inch, 12 pound redfish in one of the local creeks fishing with her husband Kenny. 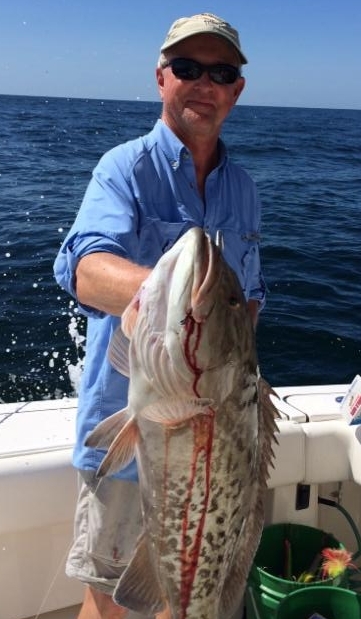 This great catch of red grouper (and one gag) were brought in by two families from North Carolina….Rick, Jeremy, Billy, Jonathan, and Will from Lumberton. Spearfishing has been amazingly productive. 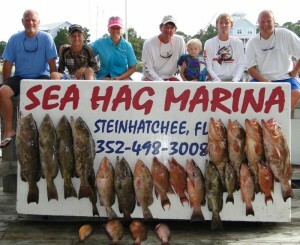 The Norwoods, the Snyders and Bill Alexander brought in this catch of grouper and hog snapper. 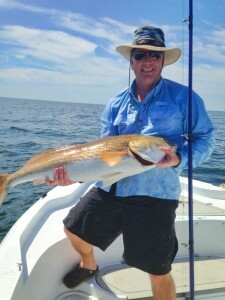 Paul Young found this overslot redfish while grouper fishing. 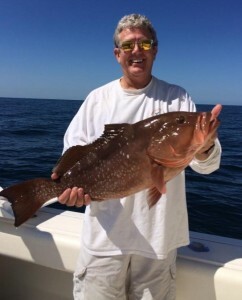 Grouper fishing is a great way to find oversize bull redfish. Jason and Ryan Norton and Cameron all hooked up at the same time. 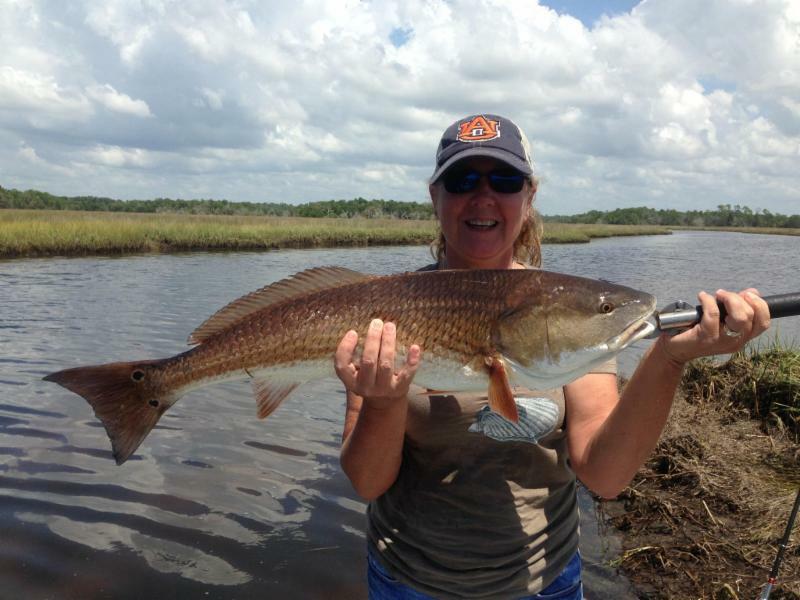 Summer Hogan from Clermont made her first redfish one to remember….exactly 27 inches long. Looking forward to continuing improvement in our fishing with one of our best months coming up. Water temperatures will continue to cool and the water to clear. Red grouper season will be closed as of October 4th. It may reopen January 1. 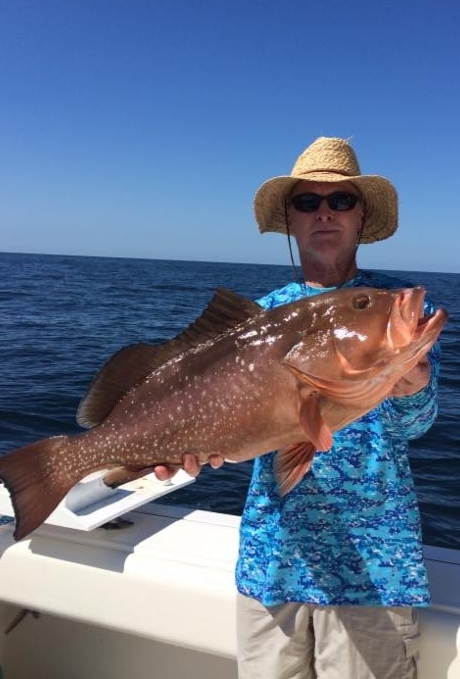 Gag grouper season is tentatively remaining open in federal waters until October 31st unless there is a change. For grouper, bottom fishing with sardines, fresh cut bait or live pinfish will be the ticket. Look for pods of whitebait and keep a live pinfish out under a float for a stray kingfish. 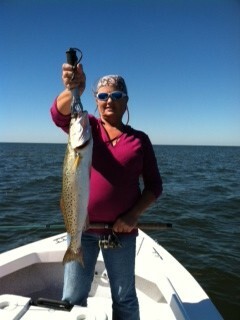 Inshore, silver (sand) trout have started showing up on the nearshore bars including Nine Mile Bank and Little Bank. 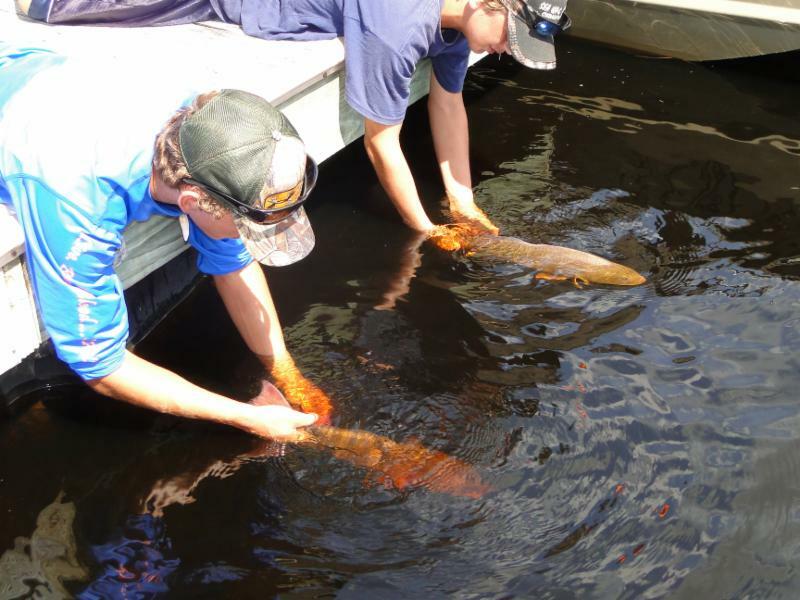 These fish fight harder than spotted trout, eat better and there is no limit. You’ll find them mixed in with spotted seatrout, especially in sandy areas, although they will come in the river when it gets cold. 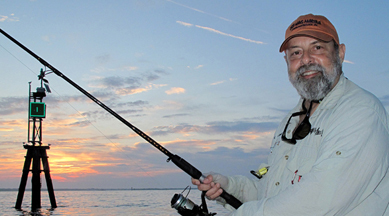 Those nearshore bars are also a great place to find Spanish mackerel and bluefish, which will be following pods of whitebait. Make sure to use a 12 inch wire leader with your spoons or Floreo jigs when you’re targeting these fish. Redfish should continue to be large and in charge. The larger fish will be schooling and getting ready to migrate offshore permanently. 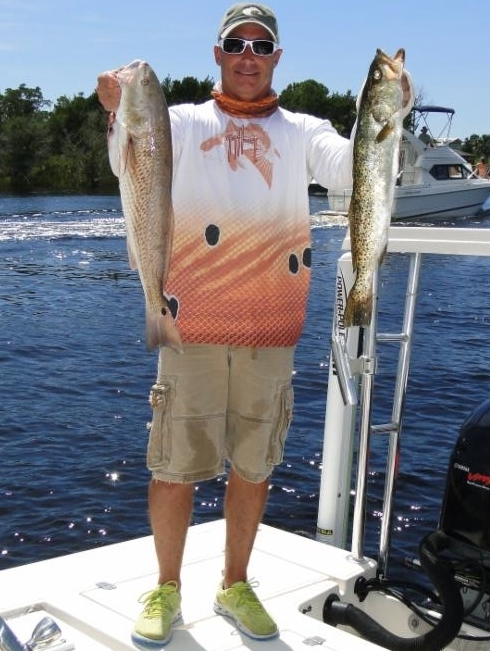 Always keep your eyes peeled while fishing the flats for schools of redfish. While they may be in shallow on flood tides, more frequently they are huddling in deeper water, up to a half-mile offshore. Trout have been taken in decent numbers fishing in potholes and mixed bottom. Some recent hotspots have been outside of Rocky Creek, west of Sink Creek and Pepperfish to the south, and west of Rock Point and Dallus Creek to the north. And as usual, there have been some good catches around the Bird Rack. 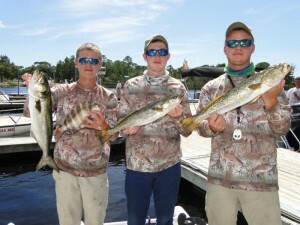 Fish in 3 feet or so of water with popping cork rigs and live or artificial shrimp, or cut bait. 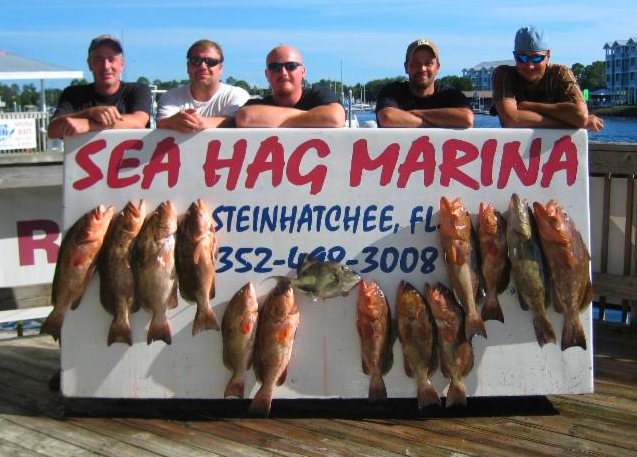 In deeper water use light colored paddletail or shadtail soft plastic jigtails. Look for Gulp, Bass Assassin, Stinky Fingers, or Z-man jigtails, all of which can be found at the Sea Hag Marina’s Ship’s Store. We’ve also added some new hard plastic lures from Sebile and Mirrolure as well. We’ve got what you need at the Ship’s Store. 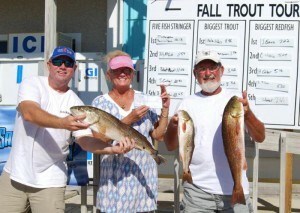 Fishing has steadily improved through September with some outstanding catches of reds, and most were oversized fish! The trout bite has also improved through the month as temps have fallen and rainfall has decreased. 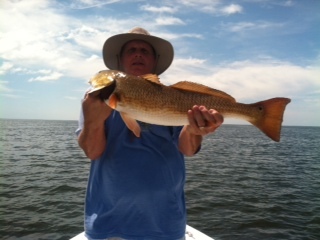 Cut bait has been very effective as has Gulp baits on Cajun popping rigs for redfish. 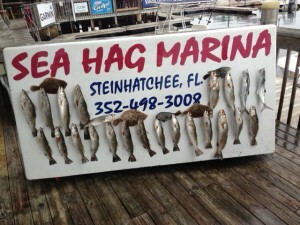 Spanish and bluefish helped fill he cooler in September . These aggressive feeders with forked tails make for great fun and their numbers typically increase as we move into October and mid November. 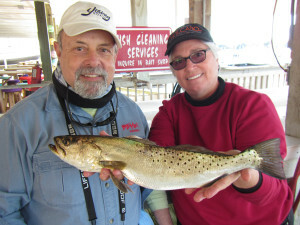 As water temps move close to 72 degrees it seems that every species makes itself available. 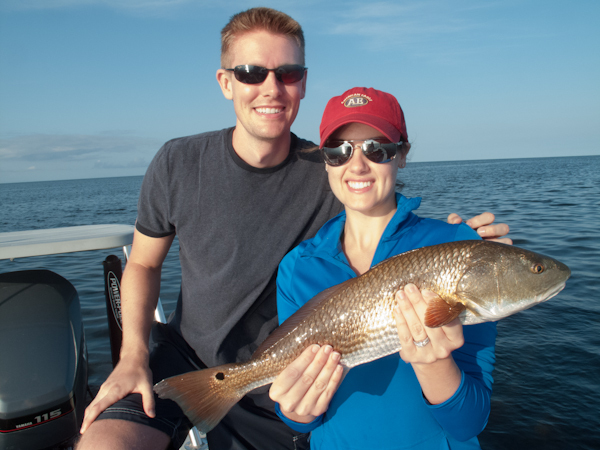 Take advantage of the beautiful fall weather and join us for some of Florida’s best fishing. As the air cools in October, so does the water. And I finally head back “to sea” for my cool-weather guiding season. 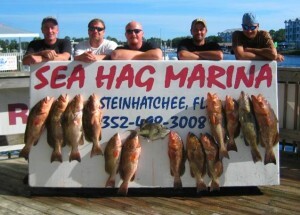 Since I don’t offer scallop charters, I generally lay pretty low during the summer months. But, when the baitfish pods and mullet schools start running, I’m ready to start chasing trout and reds. If you’re a sportfisherman, you’ll appreciate a trip with me. Yes, we do keep a few fish for dinner, but I’m pretty strict about catch-and-release aboard Photo Opportunity, my custom-built Shipoke skiff. You won’t find live or cut bait aboard either. 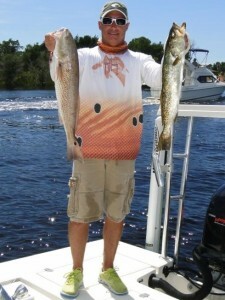 I specialize in tossing topwater or slow-suspending lures with light spinning tackle. And if you can make long casts with an 8 or 9-weight fly rod, bring it along and we’ll put you and your gear to the test. My trips have often been likened to that other Big Bend sport–hunting for Osceola turkeys! 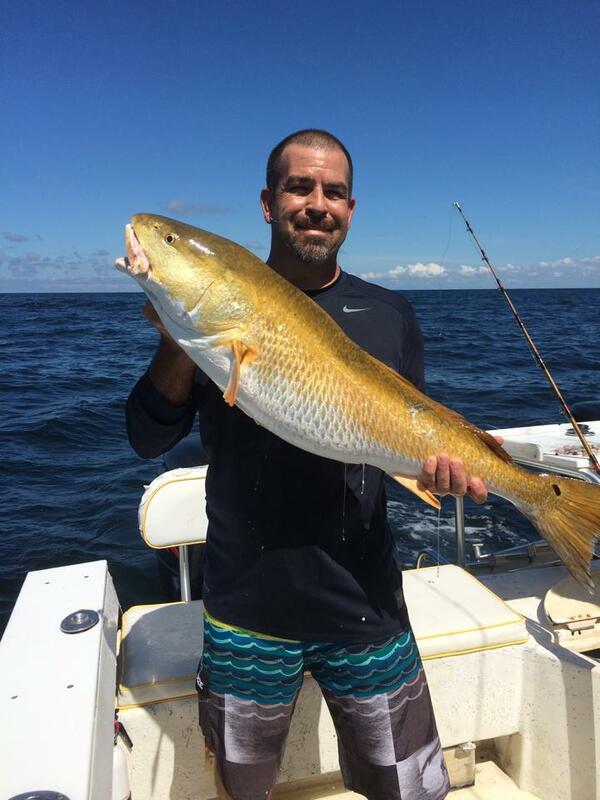 If you and a buddy (I can only take two anglers) are looking for a great, low-key sportfishing trip, give me a call. I fish every day except Mondays and Tuesdays, and offer 6-hour trips for $400, including soft drinks, licenses and high-quality tackle and gear. 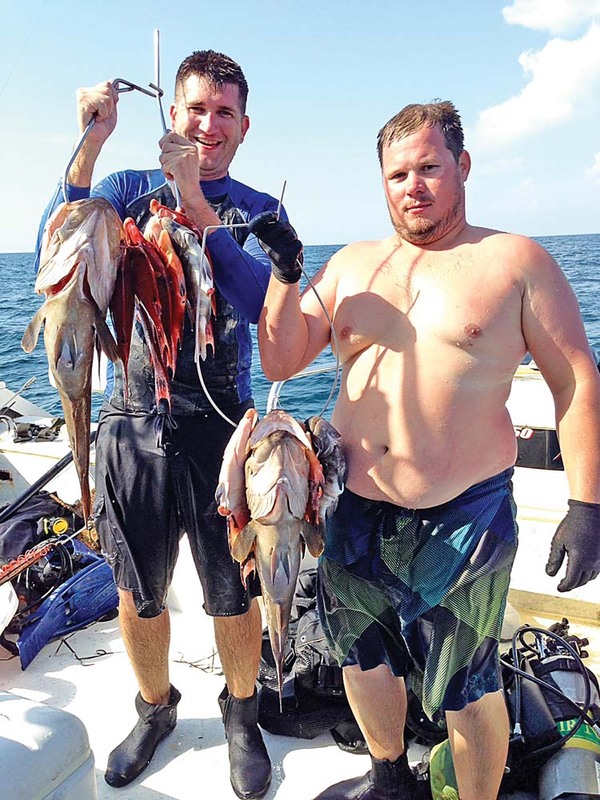 Slightly cooler weather has the baitfish headed south for the winter…when that happens, the grouper bites starts to get better. 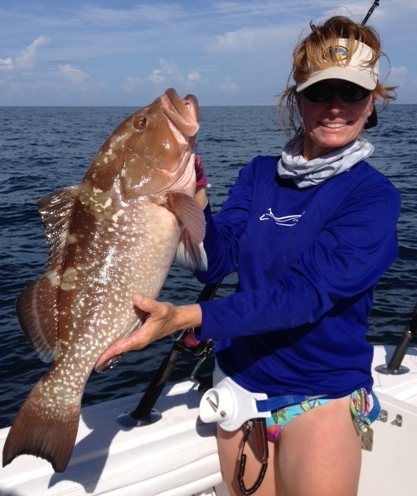 Without as much forage, both red and gag grouper are more susceptible to cut and live baits. 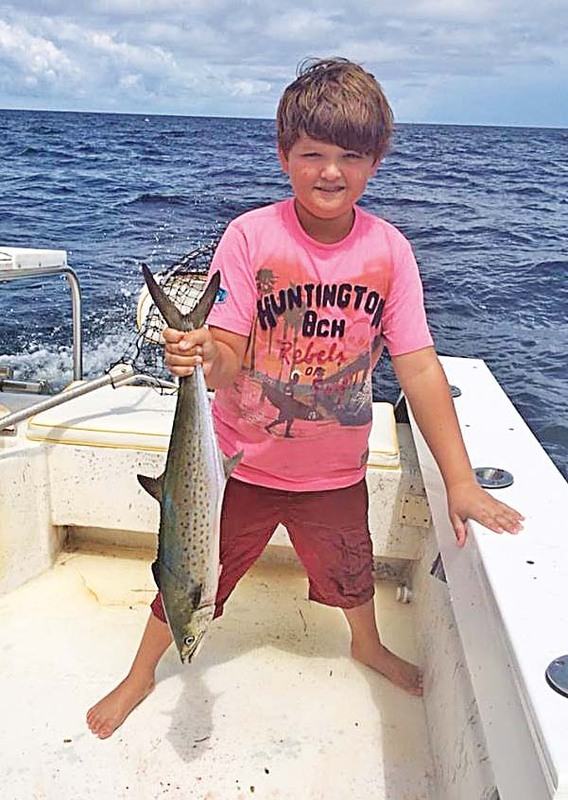 Big fall kingfish are still on the prowl and cobia begin making their way south this month as well. They are generally hungry, so have a plastic eel rigged for the opportunity, they will not give you time to rig a rod for them. I have found very few dead fish out of Steinhatchee on long offshore runs and there seem to be more fish in 30-40 feet than usual for this time of year. Don’t run past the fish! One of my favorites for this time of year is a lively bait under a kite for kings, the strikes are spectacular!